Santa Fe has gone to the dogs. It is one of the most “doggy” towns I have ever been to. There are dog parks, permissive outdoor cafes where dogs can join their people for a gourmet meal, and specialty dog shops. This is one place you’ll want to bring your well-behaved pooch. 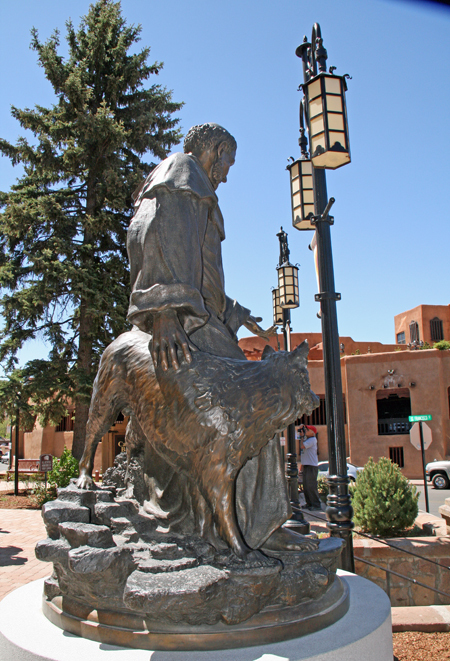 The main church in Santa Fe is named after St. Francis, who is known for his love of animals. He is the patron saint of Santa Fe. It is customary for Catholic and Anglican churches to hold ceremonies blessing animals on the feast day of St Francis, the 4th of October. The Cathedral Basilica of Saint Francis of Assisi, commonly known as Saint Francis Cathedral, is a Roman Catholic cathedral in downtown Santa Fe, New Mexico. It is the mother church of the Archdiocese of Santa Fe. In front of the church you will see a statue of St. Francis accompanied by a dog. While Santa Fe loves dogs, it is an urban setting and so dogs customarily are to be on a leash. You’ll see dogs tied outside shops while their owners do errands and at the Santa Fe Farmer’s Market you’ll see dog handlers who can hold your dog for you while you shop! Usually restaurants with outdoor patios will allow quiet, controlled dogs on a leash. While New Mexico law allows dogs on these patios, it is completely up to the restaurant whether or not they will permit dogs. Dog-blogger, Travelin’ Jackhad a few words to say about this fairly new law as well as some of his favorite places to dine with his owner. 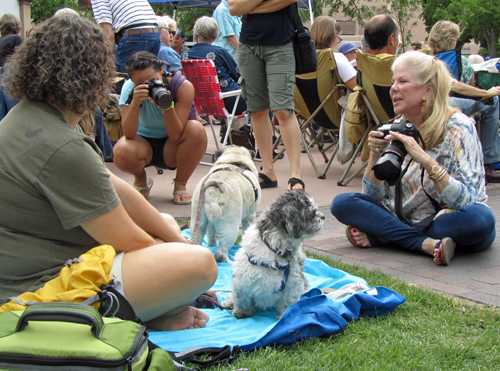 The Plaza is a fun place to walk your dog and take in the events and atmosphere. However, there are times when you cannot bring your dog to a downtown event. All animals are banned from the Plaza during the Fourth of July Pancake Breakfast, Spanish Market, Indian Market, Santa Fe Fiesta Labor Day Arts and Crafts Market and Santa Fe Fiesta. Service animals are exempt from this ban, of course. Shopping is always a fun thing to do when you visit Santa Fe. But did you know there are quite a few dog boutiques? And, you’ll be surprised to know, that there are dog bakeries! Here is a map of dog boutiques and pet shops in Santa Fe. 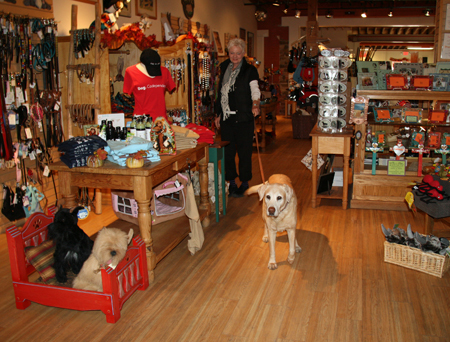 One of my favorite shops for dogs is Teca Tu, located in the Sanbusco Center near the Santa Fe Railyard. Teca Tu has southwest style collars and doggie coats among a myriad of other enticing products for your canine companion..
Santa Fe is one of the most dog-friendly towns I have seen. Most hotels have allowances for dogs, although you may be paying an extra fee.